Well, this one was hard for me to figure out. Tomoko is supposed to be watching pretty much rewinds of her past self and yet things start to change little by little as the manga goes on. This sort of story gets really predictable and so it was no surprise what happened at the end. I feel like it was a slightly a waste to read it in that regard. It’s a ok story, but just doesn’t stand out on any scale. The art style was really tiny lines that seemed like a pain for the artist to draw and in the end it was hard to make out some things that should of shown up better like the characters. It might have been really high detail but it’s hard to pull the characters out of the background if done in the same thin strokes as the background. There hair normally didn’t close at all making it sometimes hard to figure out where it ended except when there was shading. 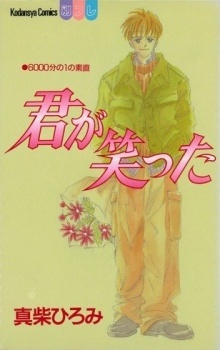 In the end, though the story had a little charm, it was pretty much mimicking a bunch of other romance stories, the artwork was plain, and the characters didn’t stand out well. The premise is interesting, albeit familiar: The main character has something she regrets not doing. When hit by a car, she is seemingly sent back to the past to relive her high school days and the one thing she regretted not doing. All I can say is the story is very touching! This means a lot coming from me because I don't like school romances. The art has a very shoujo-like favour. It reminds me a bit of Takeuchi's art, except less wispy. I found the art to be quite good, but lacking some personality. Overall the art is good in my opinion. Surprisingly good. Tomoko is one of the few shy girls that is well crafted. She lacks the courage to do something, but she realizes this and regrets it. We see her slowly understanding her mistake and resolving to change it. The main male lead, Ogata, is likable as well. He usually teases Tomoko, but hides a more mature side of himself. The biggest plus about Ogata is that he isn't chauvinistic. He tells Tomoko what he thinks, but doesn't force his view upon her. Leaving it up to her to understand what she may from his words. I was impressed by the maturity with which Mashiba-san crafted her characters.